Tuesday was cold as if winter wanted another chance; nevertheless the first bearded iris opened in the bright sunlight afternoon. A little plant added to the garden last year, Sisyrinchium angustifolium (Blue-eyed Grass), is beginning to bloom. I thought last summer’s heat had been its demise. Glad to see it pulled through after all. Given a weather forecast for early Wednesday morning of 29°F (-1.6°C), I covered the hydrangeas and crossed fingers everything else would generate its own heat. 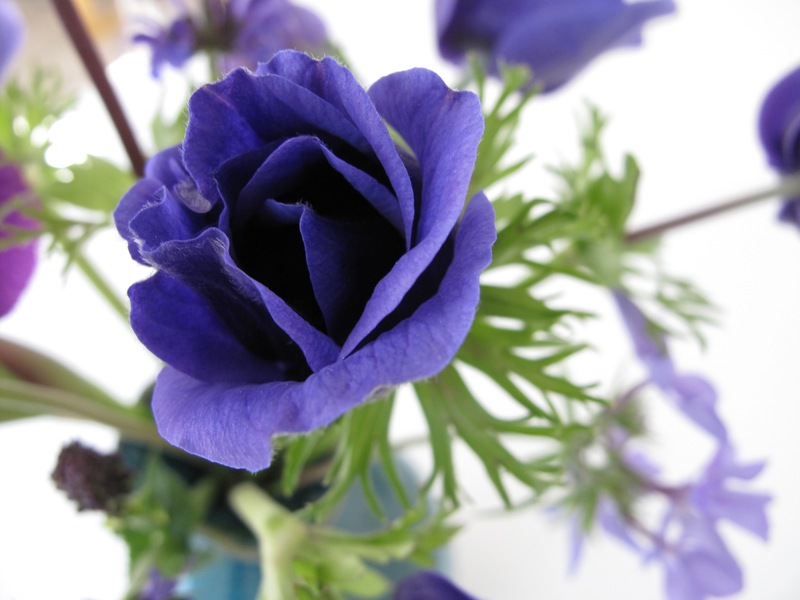 Knowing a cold night was ahead I cut the iris along with two other blues to enjoy indoors: Anemone coronaria ‘Mr. 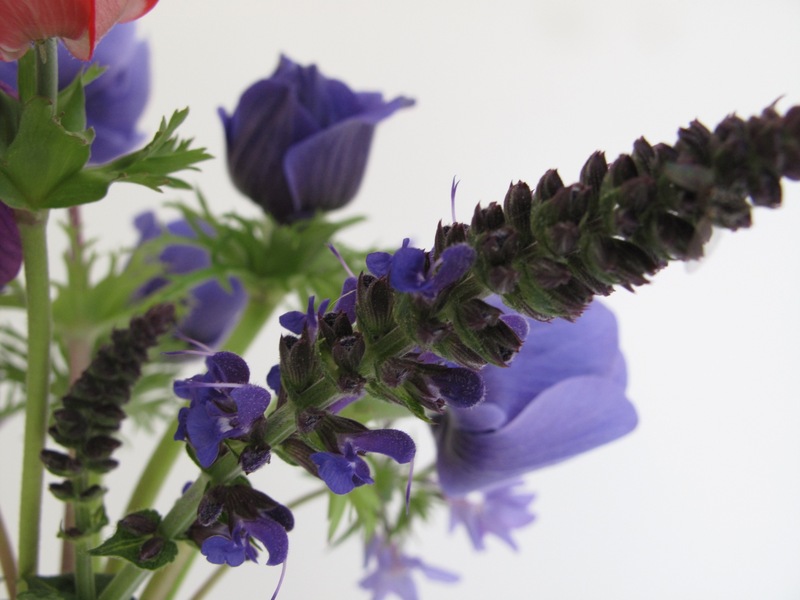 Fokker’ and Salvia nemorosa ‘May Night’ (Hardy Sage). No special arrangement, just a rescue, but I love the colors. 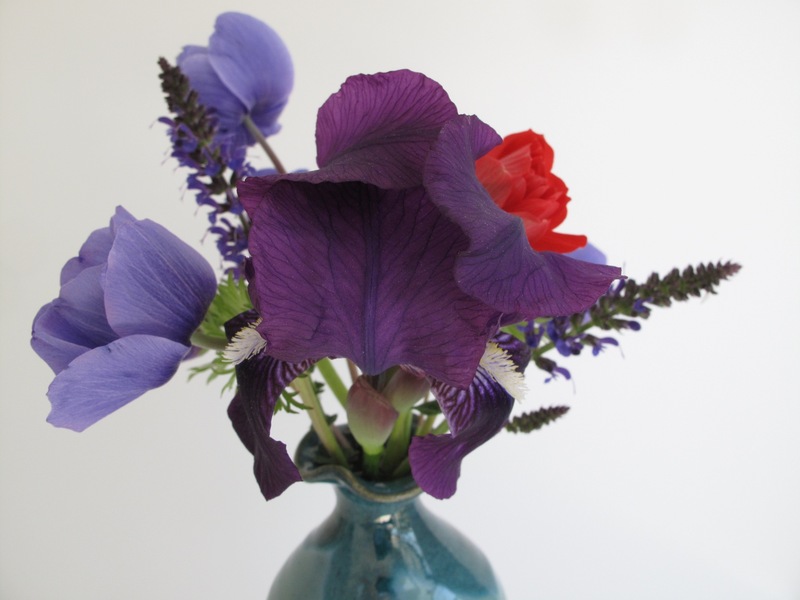 There was one red Anemone coronaria “The Governor’ that made its way into the vase as well. Another below freezing night is on the horizon this weekend too. Winter trickery. 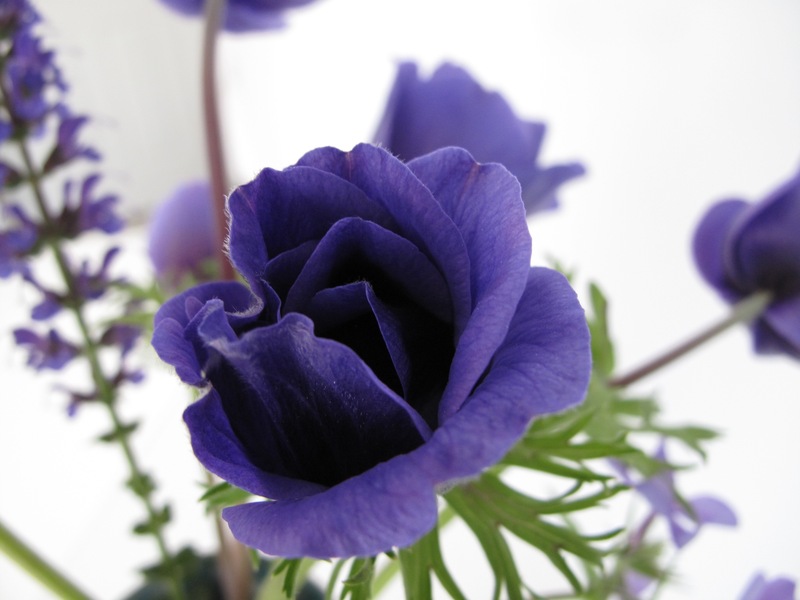 This entry was posted in garden and tagged Anemone coronaria, bearded on April 5, 2016 by pbmgarden. ‘Mr Fokker’ is a charmer, I also love how in a group the older flowers fade so the group looks like lots of different flowers. Sisyrinchium likes it dry, I had some but they were smothered by a nearby grass, I should look for others. Disappointed none of the anemones I planted this fall survived, but the ones from last year are strong. ‘Mr Fokker’ is attractive at all stages–great outdoors and in. Another commenter warned to deadhead to keep Sisyrinchium in control. I’m thinking I should take it out right now because I can’t be trusted to care for it! Purple with a touch of red…one of my favorite combos. My Blue-eyed grass thinks it wants to be a lawn…deadhead, deadhead. Oh, no. Should I pull out the Blue-eyed grass now? Depends upon how vigilant you wish to be in future…I do love the stuff. I moved it into the “hell strip” out front. Nothing does very well there so maybe it will just behave. Winter just does its thing. Had a feeling it wasn’t gone, just hiding. We are not excited about the frost warnings….but we will survive with lots of pots in the garage. 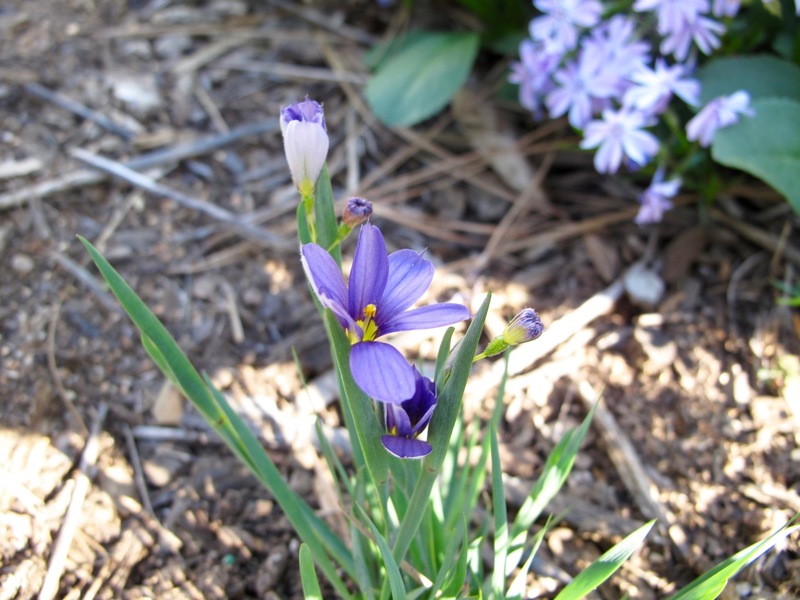 Have you found blue-eyed grass to be invasive? It most certainly was in my garden in Chapel Hill as it seeded itself in unwanted places. Last year was the first year and it died back in summer. I thought it was dead completely. But am seeing from comments I should move it somewhere else right away. Thanks John. 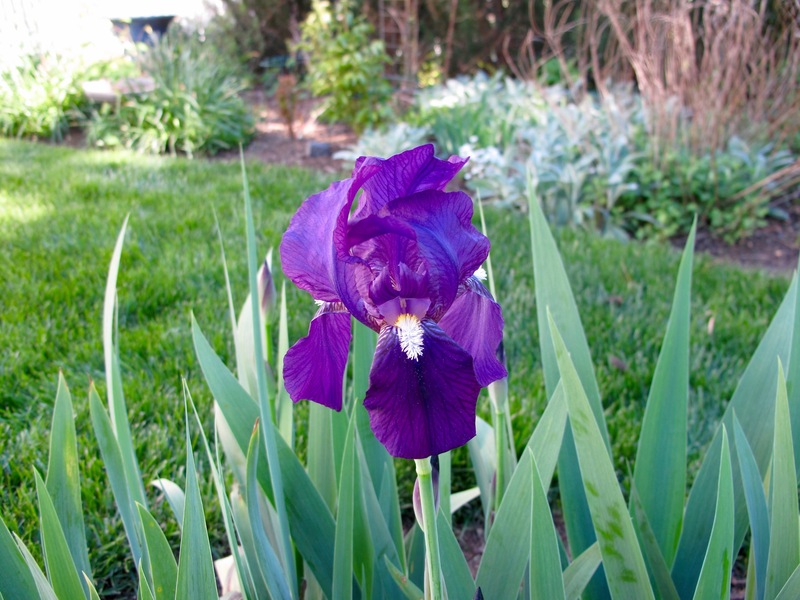 Time for your lovely irises to bloom already? Oh dear, frost is bad news. I love the colour of ‘Mr. Fokker’. I wonder who Mr. Fokker was. Would love to know who Mr. Fokker was (his name seems almost rude). I’m not sure where this iris came from. It’s been in the garden for a couple of years and last year opened April 8. 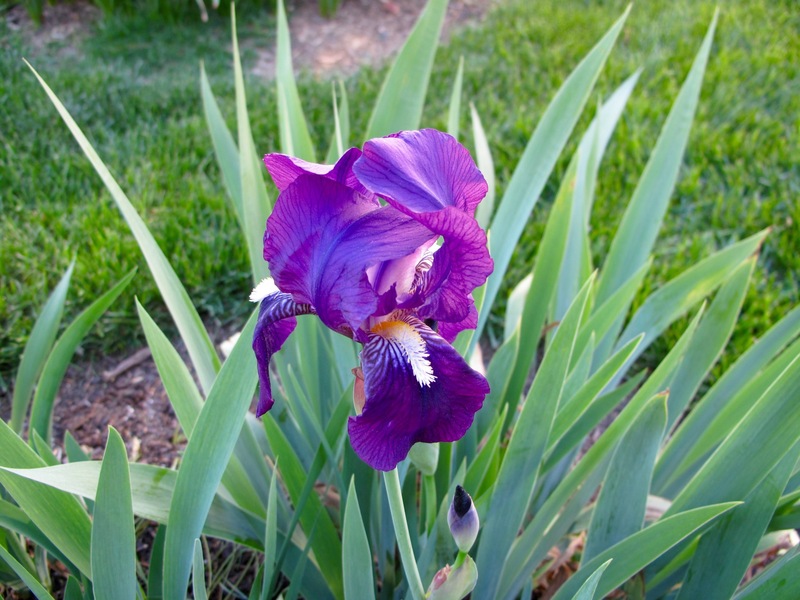 Other irises don’t look ready–they’re using blooming Mid-April — Mid-May. Oh, I really like your arrangement! That’s magical. 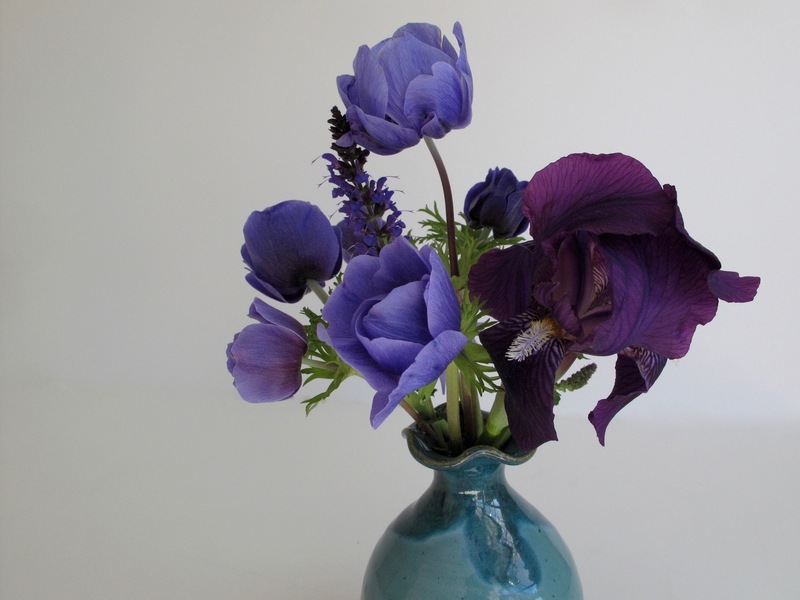 Something about the shades of blue and the shapes and the vase. Wow. Congrats on the Blue-Eyed Grass: I’ve been meaning to plant some, but haven’t gotten around to it. Thanks Beth. I moved my blue-eyed grass yesterday out into the “hell” strip in front of the house. Several people warned it can seed heavily and I didn’t want to be pulling it out of the garden. It is very attractive though. I love those colors, so saturated and intense! 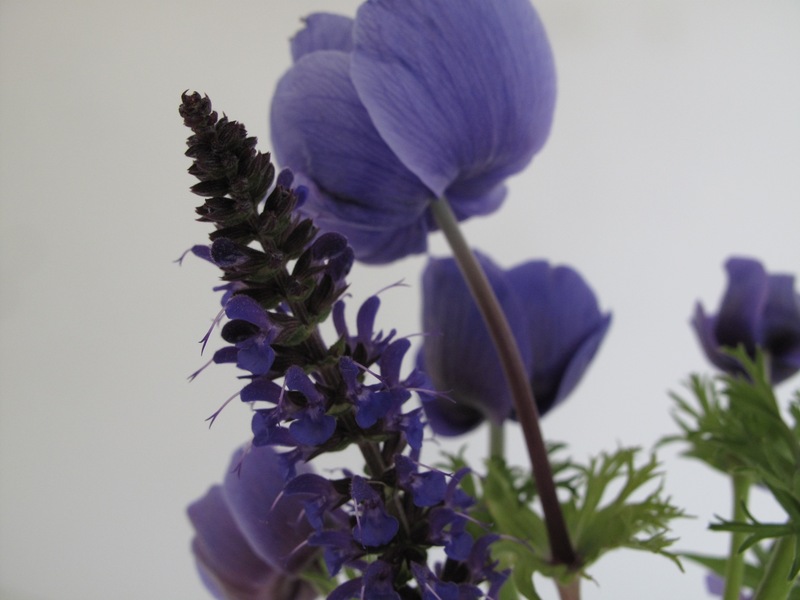 The blue anemone are my favourites, and how lucky you are to have sage flowering at the same time – they go perfectly together! I like them together also Cathy. The meadow sage is supposed to bloom all summer but mine dies back in the heat. It’s pretty when young and fresh. A stunning celebration in blue and purple despite the cold! Thanks Donna! More cold expected tomorrow night. I think the hydrangeas may be already ruined. Your ‘no special arrangement’ is still lovely. Thanks P&B, some flowers don’t need much assistance.